According to the National Institute on Deafness and Other Communication Disorders (NIDCD), approximately 15 percent of American adults are hearing impaired and require the use of hearing aids to help them hear accurately. Additionally, 2 to 3 children out of every 1,000 U.S. children born have some level of hearing loss in one or both ears. Americans are on the lookout for affordable healthcare options and with so many American requiring the use of hearing aids, the cost of hearing devices is a matter of great importance to the health and well-being of millions of Americans. The average cost for hearing aids will vary depending on many factors including the number of ears affected by hearing loss (some people need two hearing aids while others only need a hearing device for one ear), the type of hearing loss and the level of technology required for each type of hearing aid device. As hearing aid designs become more sophisticated and advanced, the price for these top-of-the-line devices increases. Many manufacturers offer basic performance levels for cheaper prices and the more advanced ones, such as noise-reduction and wireless models, will be more expensive. The price of hearing aids can range anywhere from $1,000 to $4,000 or more for each device depending on whether your level of hearing loss is mild, moderate or severe. The price for a hearing aid device covers more than just the device. You are also paying for the hearing test examination, consultation, fitting, and follow-up appointments needed for adjustments and routine cleanings. Most hearing aids come with a warranty to cover repairs that range from one to three years and a supply of hearing aid batteries. Not all health insurance plans cover hearing devices and of those that do, many have limited benefits. Others will only covered audiologists within the company’s preferred provider organization (PPO). Hearing aids are considered as an elective medical need rather than a necessity and many insurers do not offer hearing coverage. Some health insurance plans do cover hearing aids, but many have a per/ear allowance or a lifetime maximum payout for hearing benefits. Medicare does not cover hearing devices. Some states have mandates for hearing aids for children including Colorado, Delaware, Georgia, Kentucky, Louisiana, Maine, Maryland, Massachusetts, Minnesota, Missouri, New Jersey, New Mexico, North Carolina, Oklahoma, Oregon, Tennessee, and Texas. A few more states also require this coverage to expand to include adults and children: Arkansas, Connecticut, Illinois, New Hampshire, and Rhode Island. Wisconsin requires coverage for hearing aids and cochlear implants for children. For more information about which states mandate hearing aid coverage, you can visit the American Speech-Language-Hearing Association (ASHA) website. For a quick reference, the map below illustrates which states provide coverage for children, how much is covered, and how often coverage is renewed. Hover over the 23 states highlighted below for a breakdown of this information. Can I Buy A Hearing Aid Online? You can buy a personal sound amplification product (PSAP) online but this will not be prescribed and may only work for people who have a mild hearing loss. It is very hard to get a hearing aid that will help you hear accurately online. Unlike non-prescription reading glasses that you can try on, you do not have this benefit with purchasing hearing aids online. Hearing aids need to be adjusted for each user to achieve optimal hearing. It can take two to three adjustment appointments to fine-tune the hearing device for a patient. 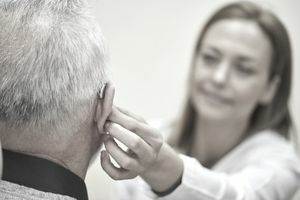 Fittings should be conducted by a licensed hearing aid professional. This is not something that is available in an online setting. Buying hearing aids is an important investment in your health and not something to be taken lightly. The right hearing device can help hearing-impaired individuals live a fuller and better quality of life. Many hearing aid providers are willing to work with people on a limited budget to set up payment plans for the purchase of hearing devices. If you need a hearing device, don’t let a limited budget stop you from making an appointment with a licensed audiologist. Planning a Trip to the Dentist? Here’s How Much a Filling Costs. How Much Is the Monthly Premium Cost of Medicare Part D? What Is the Financial Cost of Diabetes? Understanding Single-Payer Health Insurance or "Medicare for All"
Have You Had a Qualifying Life Event for Health Insurance?